I just realized how much I have been talking about romance these days!! Chalk it up to putting our feet up for a bit in France and letting some of our daily stresses form home melt away. It’s also really hard not to feel that dreamy, relaxed loving way when you sink into such a beautiful, serene environment. And for me, spending less time on my phone is such a delicious way to reconnect with the people right in front of me! But I do promise that I will get on to other topics soon enough – right after this lovely romantic dinner. This was one of our final evenings, and one of our rare few just us. After we settled our son to sleep, we lit the candles per usual and had a lovely sunset dinner on my grandmother’s terrace. I’m sure it’s not hard to see why this is one of my favorite places in the world. 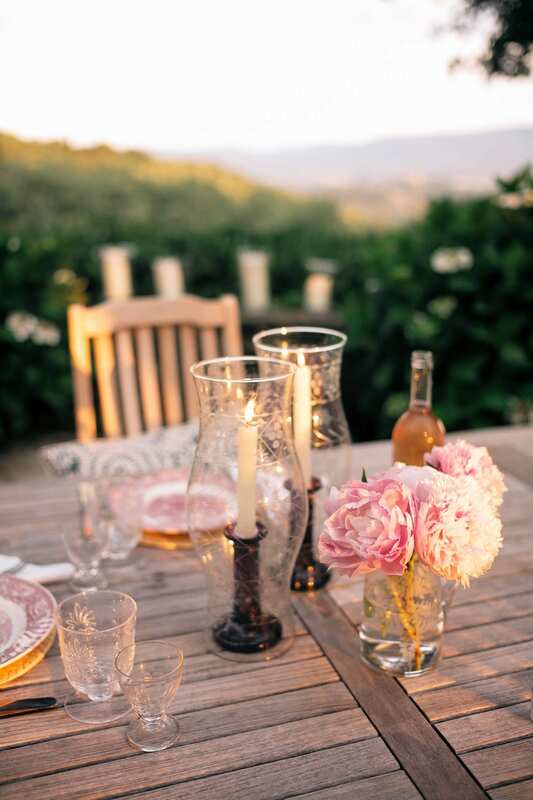 These etched candle shades are one of my favorite things of hers and are so lovely and romantic, I let them be at the center of our table so that we can enjoy them. On this particular evening, I used simple woven placemats and one of our new plate sets from the Jas des Roberts. 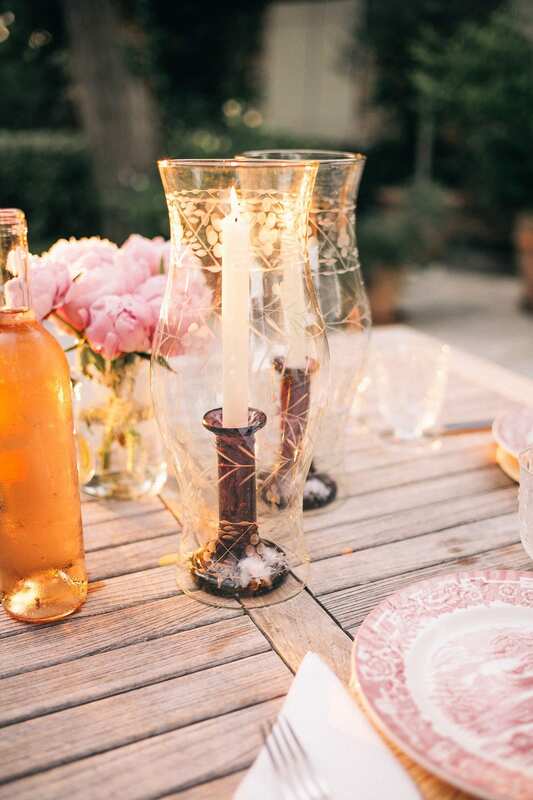 A simple linen napkin, fresh market peonies and etched glasses completed the easy set up. 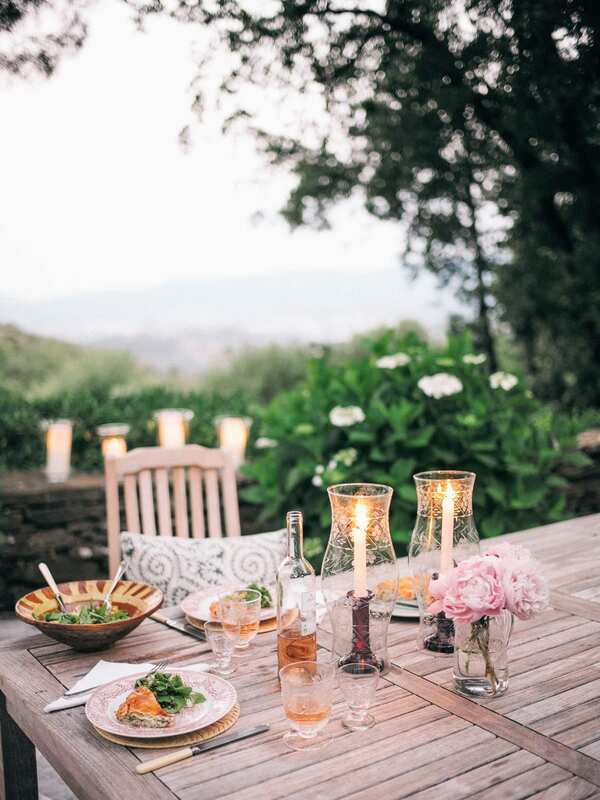 I love that last moment of glowing daylight, after which the candles really start to twinkle – its the most romantic dinner moment of all. There is no light outside so we have to light up the wall and other tables around — I think it was over one of these dinners when I was so swept up that I suggested to Will that we live by candlelight after dark for a year. He quickly dismissed that idea!